Humanely Harvested: dog hair is NOT weird! - Knit Your Dog! Home dog hair Humanely Harvested: dog hair is NOT weird! Once you see the difference between harvesting dog hair and any more conventional wool type, you will understand why Kendall Crolius said: “Better a sweater from a dog you know and love than a sheep you’ll never meet!” Dog hair is NOT weird. My friend Ann (that’s her real name) is no shrinking violet. She’s the most tenacious and committed public servant you’ll ever meet. No one can get a rat-infested property cleaned up more quickly. She walks crime-riddled streets with neighbors, takes on bullies of all kinds, fears no one. Believe me: Ann is tough. Dog hair is Ann’s Kryptonite. No matter how many people show her how lovely it is, touch it right in front of her, bury their noses in it, Ann cannot bring herself to even look at anything made from dog wool. Once the hair comes off the dog, she flees from it like the plague. Ann prefers acrylic, lambswool, sheep’s wool, angora, alpaca…anything but dog. She does actually freak out at the mere thought of it. Back to Kendall’s point: you know and love your dog. I sure know and love mine. And a loved dog is usually a well cared-for dog. They live indoors, they get exercise and affection, baths, toys, all of that. And they get brushed. Dogs that are well loved are usually pretty clean. And they are usually well groomed. Now, granted: not all dogs like to be brushed. I’ve written before about the mortal peril into which I placed myself when trying to brush my beloved, departed Fuzzy. But a lot of dogs love to be brushed. One friend of mine has a Newfie that will lie on the floor for hours when being brushed. She begs for more. She paws at the hand holding the brush when it stops. The Shed Squad here doesn’t go that far, but we do enjoy the interaction of brushing. I go gently and turn it into a bonding session. Clarence, my Peke, will actually lie in my lap for hours with the TV on or soaking up the sun while I gently stroke him with the slicker brush. Those lovingly collected fibers are then cleaned and turned into wool. And that wool is luxurious. Other animals? Not so nice. Linda, our spinner, went with several of her spinning friends on a real adventure not too long ago. 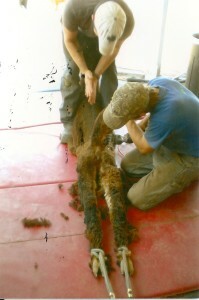 A few hours’ drive away, they visited an alpaca farm and took part in shearing the flock. Alpacas are adorable creatures, such sweet faces, originally from the Andes mountains. Just look at those beatific smiles, the big dark eyes, those curly-top crowns and dainty ears. They’re like little stuffed toy camels! Until you need to shear them. 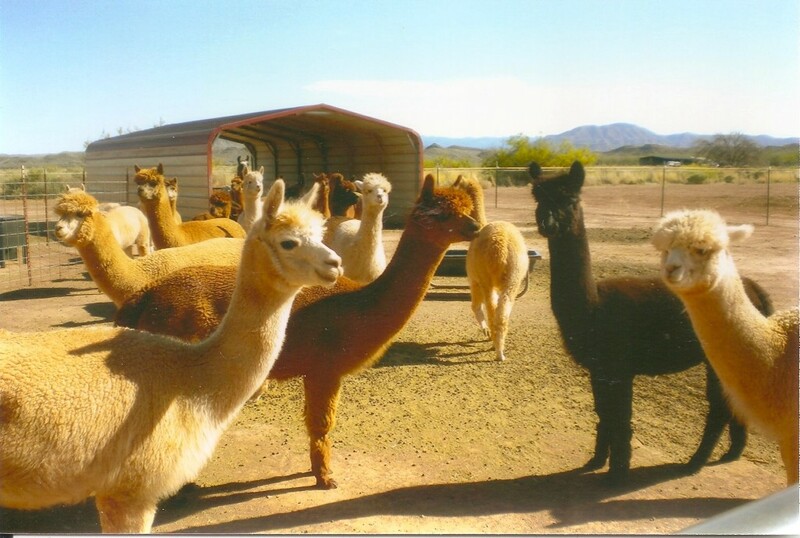 Like other camelids (camels, llamas, alpacas are all camelids), alpacas live outside. They’re not house pets. And once a year, that fabulous fleece needs to be shaved off of them. Not something they enjoy. 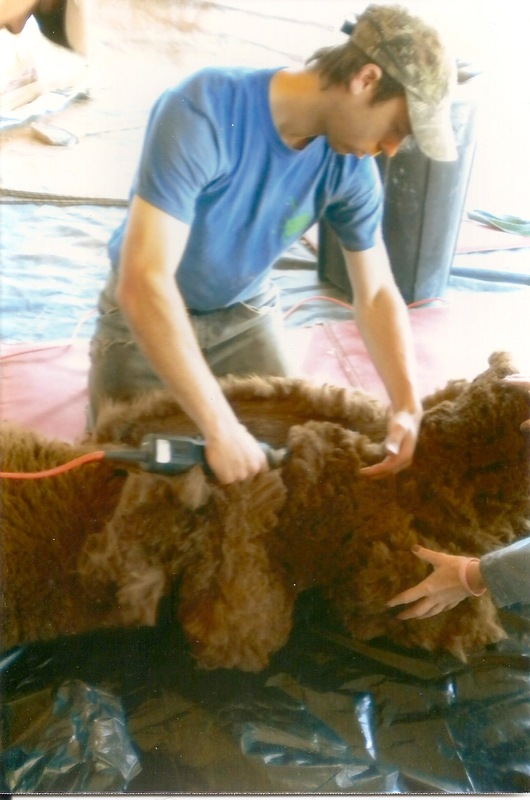 They don’t sit in the shearer’s lap while their fur is lovingly collected. Oh no… First, they’re corralled, and then they are hog tied. 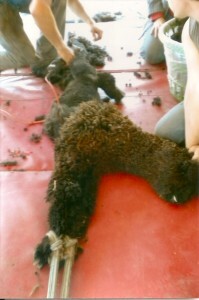 Their rear legs are bound and tied down, and then their front legs. Once they are immobilized, the shearing can begin. Now just imagine for a moment, knowing as many of you do, how little many dogs enjoy the sound of an electronic clipper. Now imagine the same dogs not enjoying the sound of the clipper while hog tied and pinned to the ground. And as Linda pointed out to me, “did you know alpacas spit green stuff at you?” So you restrain them against their will and shave while they spew bile at you in anger. And this is how we get alpaca wool. So, I look at how we harvest dog — sweet, docile, relaxing for all concerned — and how we harvest alpaca — a freakin’ nightmare all around — and then I remember the sheep shearing scenes from The Thorn Birds (fast forward to 3:09 and don’t blink!) and I just cannot understand why anyone freaks out over dog wool and not over wool from livestock. Will I stop wearing alpaca? Oh HECK no. Love the stuff. Will wear it, knit it, sing its praises until I can no longer. But why anyone would think dog wool is strange, I’m just not there. Sorry, Ann. But Kendall is right. And dog hair is NOT weird. It’s the most sustainable, humanely harvested natural animal fiber I can think of! Can this be done with car hair? I have a Norwegian Forest cat with beautiful long hair & have been saving the brushings. It can be done. I must point out, however, that cat hair is different than dog hair. We do not have experience with cat hair so we cannot do it for you. Do you know of someone who can do this using cat hair? I do not. There are several Etsy shops who advertise the service but we have no experience with any of them.